Need tickets? Jump straight to our ticket listings > with tickets from eBay, StubHub and +100 other sites all listed in one place for comparison shopping and the best deals! The 2011 MLB Playoffs have bucked the trend of “pitching wins championships” at every turn, and the last game before the 2011 World Series was no exception. Facing elimination at the hands of the St. Louis Cardinals, the Milwaukee Brewers trotted out off-season trade acquisition Shaun Marcum at home to keep the Cardinal lineup in check and give his offense a chance to pull his team even in the series; St. Louis countered with their own in-season acquisition, Edwin Jackson, to do the same for their team. Neither man lasted to record an out in the third inning, but the St. Louis Cardinals inflicted damage early and often to win on the road and secured their place in the 2011 World Series. There the Redbirds will meet the Texas Rangers, back in the Fall Classic for the second straight year, starting on the road once again. This year’s run in Arlington is lacking a staff ace with the name recognition of Cliff Lee (who’s been on permanent vacation with fellow Philadelphia Phillies Roy Halladay, Roy Oswalt, and Cole Hamels in yet another example of this season’s disregard for pitching), but the Rangers still have more than enough pitching to compete for a trophy. Pitching is obviously still important. Everything in baseball starts with the pitcher. He dictates the pace of the action and quite literally holds the game in the palm of his hand on each and every play. And so a look at 2011 World Series Game 1 must begin with the matchup on the mound: St. Louis Cardinals ace Chris Carpenter versus 16-game winner C.J. Wilson of the Texas Rangers. Carpenter won the National League Cy Young in 2005, helped lead the Cardinals to the 2006 World Series title, battled through injuries in 2007 and 2008, and is again leading his team deep into the playoffs this season. He is 2-0 so far in this postseason and will be relied upon for every bit of his veteran leadership – and perhaps three starts if the 2011 World Series goes to seven games – against a lineup as powerful as the Rangers’ one featuring outfielders Josh Hamilton, Nelson Cruz, and super utility man Michael Young. Wilson, on the other hand, has had a tougher haul in the postseason and currently stands at 1-2 in the 2011 MLB Playoffs. His one victory was not a dominant performance, for he surrendered five walks in only 4 2/3 innings of work. He has not pitched more than six innings in any of his starts and will face a St. Louis Cardinals lineup featuring a left-handed pitcher’s worst nightmare: all-world right-handed first basemen Albert Pujols. Pujols broke his wrist this season and still finished with 37 home runs and 99 RBI. He’s followed that up with a ridiculously good postseason line to the tune of 1.211 OPS, leading a lineup that scored in the first inning of every game in the National League Championship Series. Wilson (and every other Texas Rangers starter) will have his work cut out for him. The Cardinals will host the first two games of the 2011 World Series at Busch Stadium in St. Louis, MO, despite having fewer regular season wins than the Rangers. This is thanks to the National League’s victory in the MLB All Star game – a victory clinched by a homerun from the now-defeated Milwaukee Brewers’ first baseman (and free agent to-be) Prince Fielder off of 2011 World Series Game 1 starter C.J. Wilson. I’m guessing the St. Louis players made sure to thank the Brewers for this courtesy before they headed home after the NLCS Game 6. 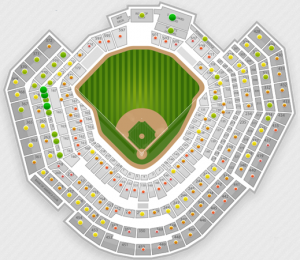 The Best Deal according to SeatGeek’s Deal Score rating is $441 to watch from the Scoreboard Patio section in deep center field. You can find the second-best deal in the Champions Club section in the Left Field corner for $518; there’s another Champions Club ticket highly-rated at $545. If money’s no object, look to section 143 directly behind the home dugout on the first-base line. Seats there start at $1,148 a piece and go to a game-high $3,994 per seat. 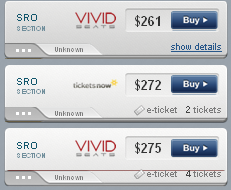 The cheapest walk-in price is for Standing Room Only Tickets (SRO), currently starting at $261. These seat prices are already higher than those for the last game held at Busch Stadium just a few days ago in the NLCS. The Fall Classic will return to Rangers Ballpark in Arlington, TX, for Game 3, so be sure to keep an eye out on those tickets if you’re a fan who can more easily make it to a game in the Lone Star State. 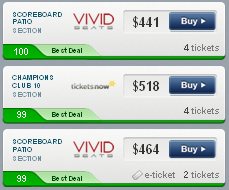 Questions about SeatGeek or 2011 World Series Game 1 Ticket Prices? Contact us on Twitter @SeatGeek or email chad@seatgeek.com.